Australia has broken its promise to the next generation, according to a new report which found securing full-time work by the age of 25 is no longer a reality for half of young Australians. The New Work Reality report, published on Thursday by The Foundation for Young Australians (FYA), is a longitudinal report which follows the journeys of 14,000 young people over a decade. It found young Australians increasingly faced a number of significant barriers when seeking full time jobs, with only 26 per cent of 15 to 24 year olds in full-time work, compared to 53 per cent in 1980. 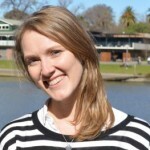 FYA CEO Jan Owen told Pro Bono News a number of concerns had been thrown into “stark reality” by the report. “Australia’s promise to our young people has been that their education is the ‘golden ticket’ to a full-time job,” Owen said. According to the report, the underutilisation of so many young Australians in the workforce is costing the economy 790 million lost hours of work each year, equating to up to $15.9 billion in lost GDP. The report, which marks the sixth in the series, also drew attention to the social impact, of a loss of confidence, hope and self-esteem, which has led to mental health issues costing Australia $7.2 billion per annum. It found prolonged periods of unemployment and underemployment had serious implications on a young person’s self-esteem and general mental health as they transitioned to adulthood. As many as 40 per cent of young people identified as having low levels of social and emotional wellbeing. “This ‘crisis’ period of the mid-twenties is characterised by insecurities, disappointments, loneliness and depression,” the report said. The report stressed that young Australians lacked confidence about their working futures. Three quarters of young Australians did not believe they had the relevant vocational and practical work experience that the job market called for, while seven out of 10 believed there was insufficient job availability. How young people create a full-time workload has also changed, with the number of young people working full-time hours in casual jobs doubling since 1992. Owen said the New Work Reality series of reports highlighted the transformational changes affecting the way people work and live. “Technological advancement and global trends are changing the nature of work, the structure of economies, and the types of skills needed by labour forces across the world,” she said. She said the latest report identified four ways to accelerate the transition to securing full-time work. 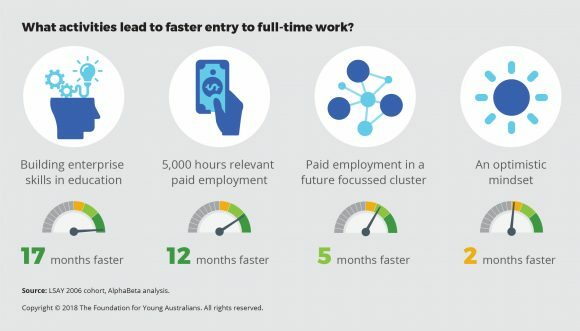 “Through comparing the journeys of young people who have secured full-time work compared to those who haven’t, the report identifies four factors that can accelerate the transition from full-time education to full-time work,” she said. According to the report having courses teach enterprise skills like problem solving, teamwork and communication, could increase the speed of entry to working full-time hours by 17 months. Combining study and work in a job could speed up the transition to full-time work by 12 months when 5,000 hours of paid employment were completed. Finding employment within an area of work which had strong growth future prospects could speed up the transition by five months. Having an optimistic mindset and strong well-being by age 18 could also accelerate the transition by up to two months faster than a young person who was unhappy or not confident with their career prospects before leaving school. Owen said: “More than ever before young people need access to a relevant, high quality education and learning pathways that reflect and respond to their changing and diverse needs, and those of the economy. As part of the report FYA called for a nation building education strategy to redesign the learning system and curriculum from preschool through higher education (and beyond). It also called for a commitment to work integrated models of learning to ensure opportunities to gain critical relevant work experience; and a targeted policy to strengthen the focus on mental well-being to prepare young people entering this transition period in their lives. Owen said the new work order was already here. “This report highlights that for our young people, the future of work that we have been forecasting is already here,” she said.